When most people think of trending topics, they think of Twitter. But there are trending and popular topics across other platforms, too. If you’re just getting started on Twitter, here are ways to use Twitter as a listening tool. Google, Facebook, Pinterest, and Twitter all have trending and popular pins and articles. There’s too much about trending topics for just one article, so it will be a series. 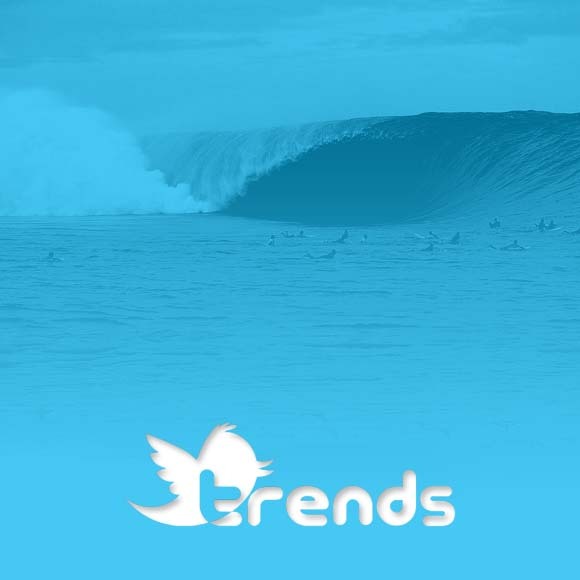 Trending topics can be like a wave. You might see one coming and decide to catch it. It’s not the most evergreen of content, but something that’s here one minute and probably gone the next. If that’s part of your strategy, it can lend an air of spontaneity to your posts. If most of your posts are scheduled and carefully crafted, having some spontaneity can add an element of fun. Above are trending topics, from my own Twitter account. The top one, about Amazon’s Prime Day, could be used by anyone selling something. You could say something about a July sale that isn’t disappointing. If you’re in music, you might want to comment on Neil Young pulling his catalog from streaming service. 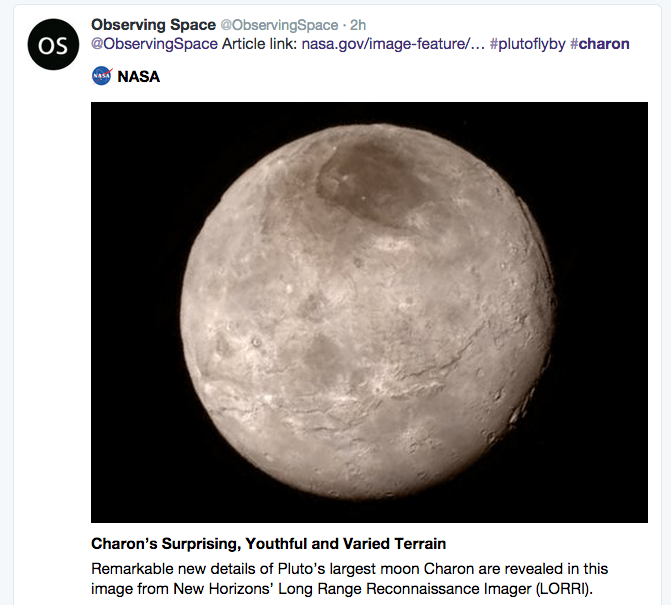 If your audience enjoys science, you could jump on the Charon (Pluto’s moon) trend. For someone in the social media arena, Kim Kardashian’s buying likes could be a major failure, and a good topic of conversation. You might not want to pick just any trend to post–decide based upon what your audience would like to see. For instance, I tweet about startups, leadership, and social media, so I’d want to make sure that those were the trending topics I posted. If you post about cars, look for trending topics around automobiles, tires, car safety, etc., which are fairly common. As outlined in the Wall Street Journal, Twitter has recently added descriptions under its trending topics to give them some context. Previously, Twitter had a Discover tab (missed dearly by some of us old-time Twitter fans). 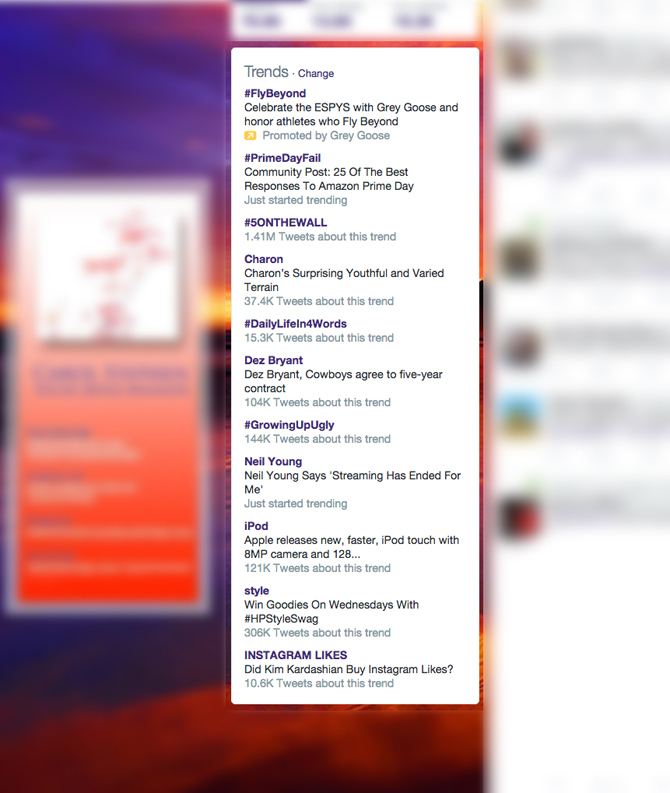 Supposedly, these new and improved trending topics will add context to appeal to Twitter newbies. For anyone, having some context could be useful. You can also see how many tweets there are about a trending topic, although I wouldn’t base my decision to jump on a trending topic wave based solely on the number of tweets. For instance, the #GrowingUpUgly hashtag would probably not appeal to my audience, despite its 104 thousand tweets. The trending topics can be changed to another city. 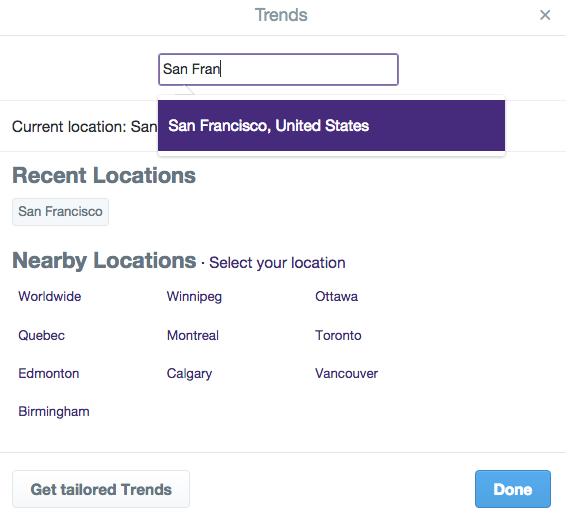 For instance, since I’m in the San Francisco Bay Area, I could switch from tailored topics to San Francisco to see what’s different. Just click at the top left (on desktop) to switch back and forth. 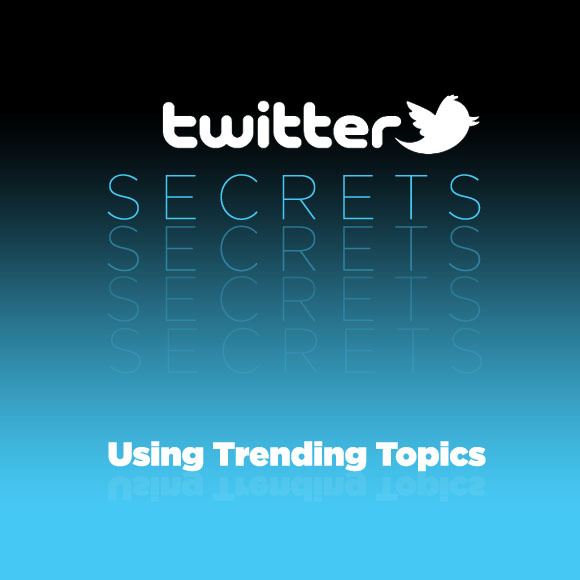 How Do You Use Trending Topics? Do you pay attention to them at all? Or just ignore them? Leave me a comment!